Made with lightweight stretch fabric for hard-to-beat comfort and a hidden expandable waistband, our stretch denim trouser pairs back perfectly with your favorite polo, or back to your sharpest Haggar sport coat. 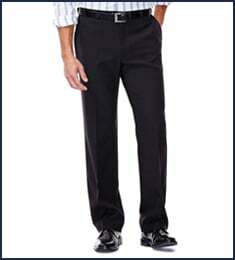 Big & Tall Stretch Denim Trouser is rated 3.5 out of 5 by 10. Rated 4 out of 5 by wesmac from extended waist pants very happy with Haggar pants, i particularly like the stretchable waist for comfort. Rated 1 out of 5 by rafa from Big pants The pants have very long zipper and cross/ crutch point. When you seat down looks very big on you The fabric is excellent but is a pity that they look so big. Rated 3 out of 5 by scott sammons from Nice Fabric, needs work on quality Bought this a few weeks ago. Button is to big or opening to small as you have to force the button through the button slit. Runs large but not a big deal. Lot of stray thread around seams so quality is an issue. Nice jeans if none of that bothers you. 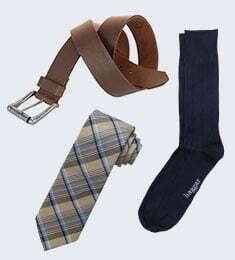 Rated 5 out of 5 by TeacherDRP from A Better Trouser Than The Non-Stretch Choice I have been purchasing pants from Haggar for several years and have acquired quite a few--the older ones relegated to being "work" pants--the newer ones get to "go out on the town." 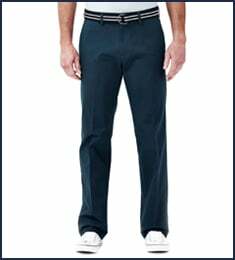 You will notice that Haggar offers two very similar pants, the other ones comprised of 100% cotton, and this choice--the stretch version--is 63% cotton, 36% polyester, and 1% Spandex. These seem to wear better and look better after many washings. As a big and tall person (thanks to my waistline), I also prefer the pleated front over the flat front as it seems to disguise the fact that I am a bit overweight. 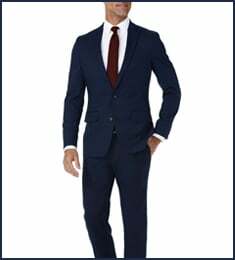 Rated 1 out of 5 by Butch1 from Big&Tall Stretch Denim Trouser Pants legs are to wide ,they should be tapered .They look slimmer in the adds.